"Our Man Bashir" is the 82nd episode of the American science fiction television series Star Trek: Deep Space Nine, the tenth of the fourth season. It originally aired on November 27, 1995. in broadcast syndication. Directed by Winrich Kolbe, the story originated from a pitch by Assistant Script Coordinator Robert Gillan and was turned into a script by producer Ronald D. Moore. Both hairdressing in the episode and the score by Jay Chattaway were later nominated for Emmy Awards. The show's plot involves the combination of a transporter and holodeck malfunction. Set in the 24th century, the series follows the adventures on Deep Space Nine, a space station located near a stable wormhole between the Alpha and Gamma quadrants of the Milky Way Galaxy. In this episode, Dr. Julian Bashir (Alexander Siddig) plays a 1960s secret agent alongside Garak (Andrew Robinson) in a holosuite. After a transporter accident makes several other crew members appear as characters in the program, the duo must prevent any of them from dying in the game or else they will be killed in real life. The production team deliberately avoided holodeck malfunction related episodes as they felt they had been overused on Star Trek: The Next Generation. However, Gillian pitched the circumstances that caused the issue seen in the episode and Moore came up with the 1960s setting. One of the influences for the episode was the James Bond films, while taking its title from Our Man Flint, which was also raised by several reviewers. This obvious influence resulted in Metro-Goldwyn-Mayer contacting the studio and the later references to it in the episode "A Simple Investigation" were toned down. "Our Man Bashir" received Nielsen ratings of 6.8 percent, and while the episode was mostly praised by reviewers with particular attention paid to the performance of Avery Brooks, there was some criticism levelled at the depiction of women. Dr. Julian Bashir (Alexander Siddig) is in the holosuite playing a secret agent program in the 1960s. Elim Garak (Andrew Robinson) intrudes and convinces Bashir to let him tag along. Meanwhile, Captain Benjamin Sisko (Avery Brooks), Lt Cmdr. Worf (Michael Dorn), Lt. Cmdr. Jadzia Dax (Terry Farrell), Major Kira Nerys (Nana Visitor), and Chief Petty Officer Miles O'Brien (Colm Meaney) are on a runabout, returning to Deep Space Nine. As they arrive they find that their vessel has been sabotaged and that a warp core breach is imminent. Lt. Cmdr. Michael Eddington beams them out, but during transport the ship is destroyed and the transporter damaged. Eddington is forced to store their patterns until it is repaired, but this uses almost all of the station's memory, putting many station systems off-line. Their physical patterns end up in the computer controlling the holosuite, where they appear as characters in Bashir's program. Bashir is startled to see Kira appear as a Russian spy, who introduces herself as Colonel Anastasia Komananov, KGB. She has no idea who Major Kira is. Eddington informs Bashir and Garak that they can't shut down the program or let the characters die or else they will lose the patterns of the other crew members. Komananov explains that a scientist called Dr. Noah is planning to take over the world using lasers to cut into the Earth's crust resulting in the shrinking of the tectonic plates sinking and causing global flooding. Bashir's orders are to rescue Professor Honey Bare (Dax) from Noah. Falcon (O'Brien) attempts to assassinate Bashir, who must stop Komananov from killing him or else O'Brien's pattern will be lost. Bashir, Garak and Komananov go to a casino in Paris to speak to Duchamps (Worf), an associate of Noah. Bashir manages to buy his way into a meeting with Noah after winning the money at cards but the trio are knocked out by Duchamps using a powdered drug. They awake in Dr. Noah's lair on the upper slopes of Mount Everest. Noah (Sisko) enters and gives a monologue about how he will destroy the world, and shows a big red button he will push to do it. He has Bashir and Garak taken below ground, where they are handcuffed to a laser. As the time ticks down before the laser is activated, Bare performs a final check of the laser. Bashir flirts with her, and she slips him a key and hurries out. Bashir unlocks himself and Garak, who protests that it is too dangerous to continue as the safeties are turned off in the program, which could result in their deaths. Garak is about to close the program and kill the other crew members when Bashir shoots him, grazing him with a bullet. Garak is shocked, but impressed, and agrees to continue the programme. Bashir is concerned as he expects the program will end with either the death of Professor Bare or Colonel Komananov following the defeat of Noah. The duo burst into Noah's study and Eddington tells them he will attempt to rescue Sisko and the others in two minutes. To gain time, Bashir hits the button to activate the lasers around the world. The room's occupants gasp as they realize he just annihilated the entire population of Earth except for the top of Mount Everest. Dr. Noah is still not prepared to spare Bashir, but just as he is about to shoot, Eddington is able to transfer the crew's patterns into the computers aboard the USS Defiant. They are then simply beamed aboard, returning to their normal selves. In the holosuite, Bashir and Garak end the program with relief: Bashir "saved the day" by "destroying the world", Garak notes; Bashir jibes Garak that they never taught him that in the Obsidian Order. Producer Ira Steven Behr wanted a holodeck episode for Deep Space Nine that was different from any seen on The Next Generation. Story editor René Echevarria was keen not to have a damaged holodeck story appear, as he felt it had been overdone in Star Trek: The Next Generation. It was specified in the information sheet sent to freelance writers that Deep Space Nine was not accepting stories involving malfunctioning holodecks. Producer Ira Steven Behr explained that the show had been looking for a unique holodeck story that would be specifically for Deep Space Nine rather than Sherlock Holmes and Dixon Hill detective stories seen in The Next Generation. Whilst Bashir and O'Brien's adventures in the holosuites in the Battle of Britain and the Battle of Clontarf have been mentioned in episodes, they were simply too expensive to be shown on screen effectively. But Behr felt that the story for "Our Man Bashir" was within the budget of the show. The story was initially pitched to Echevarria by Robert Gillan, who was on the staff of Deep Space Nine as Assistant Script Coordinator. Echevarria was immediately convinced, and told Behr about the story who was equally as enthusiastic. In Gillan's original pitch, there wasn't a specific setting clearly set out, but Behr and Echevarria were sold on the idea that nothing went wrong with the holosuites — it was simply where the computer decided to store the information following a transporter accident. Producer Ronald D. Moore came up with the 1960s setting, as he felt it was appropriate since Garak was a spy for the Cardassian Obsidian Order. He wrote the teleplay, and based it on a variety of sources including James Bond, Our Man Flint, The Man from U.N.C.L.E. and The Wild Wild West. He later explained that he "loved all of them as a kid. They had a certain panache. I loved writing that episode." 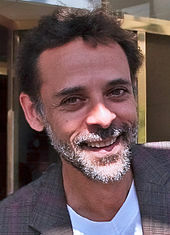 Julian Bashir, played by Alexander Siddig, was the central character in this episode. Some of the elements were suggested by other staff members, with Robert Wolfe naming Colonel Anastasia Komananov and Behr changing Suzie Luvsitt to Mona Luvsitt. Metro-Goldwyn-Mayer was later not pleased with the James Bond-style approach, and when Bashir's spy program appeared in the later episode "A Simple Investigation", the references were more generic. Dennis Madalone managed to save some time during the production as one of the shots involved Bashir seeing Falcon approach him from behind by seeing his reflection in a bottle of champagne. After time was already scheduled to attempt the shot, Madalone explained to the director that he could take the filmed sequence and digitally manipulate it onto the bottle. Madalone was also responsible for firing a cork from a bottle at Colm Meaney's head from off screen to make it appear as if Bashir did it, and managed to do it on the first take. "Our Man Bashir" was the longest shoot of any single episode of Deep Space Nine, taking nine days to film instead of the normal seven. The episode required a great deal of stunt work and special equipment, such as stuntmen going through tempered glass instead of sugar glass because of the better glass breaking effect. There was a great deal of new sets used as well, which each took longer to set up camera and lighting for as the crew were not as familiar with them as the standing sets. The backdrop used for Mount Everest was rented, but the crew realised it lacked snow so they had to modify it and then return it to the original condition afterwards. The majority of the 1960s style technologies such as Dr. Noah's base, were all custom built in house and where parts moved they were generally manually operated off screen. Art director Herman Zimmerman said that "Everything that could be manually operated was, because the brain is still smarter than most computers and you can still do some things faster by hand." "Our Man Bashir" was first broadcast on November 27, 1995 in broadcast syndication. It received Nielsen ratings of 6.8 percent, placing it in eighth place in its timeslot and lower than the episode that aired the previous week, "The Sword of Kahless", which gained a rating of 6.9 percent. "Our Man Bashir" was the final new episode of Deep Space Nine to air in 1995, with repeats running until "Homefront" aired on January 1, 1996 with ratings of 6.8 percent. The episode was nominated for two Emmy Awards, one for the score by Jay Chattaway and another for hairdressing in a television episode. Zack Handlen of The A.V. Club compared "Our Man Bashir" to "Little Green Men" from earlier in the season, saying that this episode was "better paced". Another comparison made was to The Next Generation's "Hollow Pursuits", saying that "instead of [Reginald] Barclay using the holodeck to enact his fantasies with people he can't bear to deal with in real life, Bashir is forced to keep his made up world going if he wants to save the lives of his friends". Handlen also praised the relationship between Bashir and Garak in the episode, and said "Our Man Bashir" demonstrates their characterisation. In Michelle Erica Green's review for TrekNation, she criticised the role of women in the episode, saying that they fared better in the James Bond movies. She also thought that taking the out-of-character element of the episode repeated elements seen in several episodes during the previous season, but praised the acting on the part of Avery Brooks and that Garak was "born to play a Bond sidekick". Keith DeCandido, writing for Tor.com, said that it was obvious that the actors enjoyed their new parts in this episode and said of the episode, "holy crap is it fun". In particular, he praised both Avery Brooks and Nana Visitor in their Bond-esque roles, saying that Brooks made a villain on par with those played by Donald Pleasence, Christopher Lee, and Javier Bardem. DeCandido gave "Our Man Bashir" a rating of nine out of ten. In a list of the top 100 episodes of the Star Trek franchise, "Our Man Bashir" was placed in 77th place by Charlie Jane Anders at io9. The first home media release of "Our Man Bashir" was as a two-episode VHS cassette alongside "The Sword of Kahless" in the United Kingdom on June 13, 1996, followed in the United States and Canada by a single-episode release on October 3, 2000. It was later released on DVD as part of the season four box set on August 5, 2003. ^ a b "Star Trek: Deep Space Nine Season 4 Ratings". TrekNation. Archived from the original on October 3, 2000. Retrieved December 24, 2013. ^ a b Handlen, Zack (January 24, 2013). "Star Trek: Deep Space Nine: "Our Man Bashir"/"Homefront"". The A.V. Club. Retrieved April 27, 2014. ^ Green, Michelle Erica (January 14, 2003). "Our Man Bashir". TrekNation. Retrieved April 27, 2014. ^ a b DeCandido, Keith (February 25, 2014). "Star Trek: Deep Space Nine Rewatch: "Our Man Bashir"". Tor.com. Retrieved April 27, 2014. ^ "Star Trek Deep Space Nine: Volume 4.5 [VHS] ". Amazon.com. Retrieved December 24, 2013. ^ "Star Trek – Deep Space Nine, Episode 81: The Sword of Kahless [VHS] (1993)". Amazon.com. Retrieved December 24, 2013. ^ Ordway, Holly E. (August 12, 2003). "Star Trek Deep Space Nine – Season 4". DVD Talk. Retrieved December 24, 2013. Wikiquote has quotations related to: "Our Man Bashir"
This page was last edited on 1 March 2019, at 10:14 (UTC).